For over seventy years, the Blind Association has served blind and visually impaired residents of Butler and Armstrong counties, providing education, life skills training, support, employment, and advocacy. After the participants enjoyed their unlimited bowling, the evening ended with a 50-50 raffle, where lucky winner Vick Conrad generously donated his winnings back to ‘A Night to Remember.’ Bryan Gratton also donated a ‘A Night to Remember’ t-shirt and Family Bowlaway Fun Center donated Laser Tag passes for our Chinese auction! The evening’s events closed with a special presentation to Bryan Gratton from several of the area Lions who were in attendance. Gratton was presented with a grand total of $413.00 that will go directly to support his event. Plenty of fun filled photos were taken as well! Very special thanks to Family Bowlaway Fun Center Events/Sales Coordinator, Tricia Pritchard. Tricia was very instrumental in helping to market and make the inaugural Lions Clubs bowl-a-thon a huge success. Tricia and the wonderful staff at Family Bowlaway Fun Center were very helpful whenever anything was needed throughout the evening. Cranberry Area Lion Mike Doerfler initiated this event and also served as the night’s MC. In addition, Butler Area Lions Mike and Carolyn Winkler along with Don and Linda Gibala all did a fantastic job helping to get bowlers pre-registered prior to the event, along with lending their outstanding support throughout the evening. Likewise, Lion Tim Roscoe (Cranberry Area) and Lion Robin Swank (Evans City Area) were very helpful in getting participants pre-registered, then lending their gracious support throughout the bowl-a-thon. Two very special Lions guests attended as well, with Lions District Governor Kim Stevenson and his wife Diane coming to show their district wide support for the inaugural Lions Clubs bowl-a-thon. Finally, several Evans City Area Leo Club members also came out to participate and offer their support. Overall, it was a very successful event and everyone in attendance enjoyed themselves immensely! The special event known as ‘A Night to Remember’ is an annual event that takes place in either late April or early May. Bryan Gratton, formally with Discovery Christian Church in Cranberry Township, has overseen the event since its inception three years ago. The event is designed to be a very special night for special needs teens and young adults (ages 16-40). The goal is for these special people to have one night where they can enjoy themselves and be in the spotlight. The Cranberry Woods Marriott Hotel serves as the gracious host to this one-of- a-kind night. Guests enjoy dinner, formal wear, and entertainment. All of these amenities are provided to all guests free of charge. Each guest is paired with a volunteer buddy for the evening. The buddy’s job is to make sure the guest enjoys the night to the fullest. It can certainly be said that this spectacular night is like a memorable high school prom. ‘A Night to Remember’ is made possible by generous donations from area businesses, which also have the opportunity to partner with the event. ‘A Night to Remember’ has the support of many kind volunteers who come out to help make this special night that possible. Interested in participating? Please visit discovertogether.com or e-mail Bryan Gratton, gratton.bryan@gmail.com. Questions about the Lions Clubs bowl-a-thon? Please contact Tricia Pritchard, Family Bowlaway Fun Center, triciafb@zoominternet.net, or Mike Doerfler, Cranberry Twp. Area Lions Club, mgdoerfler18@gmail.com. Founded by three Detroit-area Lions Clubs members in 1939, Leader Dogs for the Blind provides guide dogs to people who are blind and visually impaired to enhance their mobility, independence and quality of life. Each year, over 270 clients attend our 26-day residential training program to be paired with a guide dog. This is a life-changing event that opens the door to independence, safety and self-worth for many of our clients. 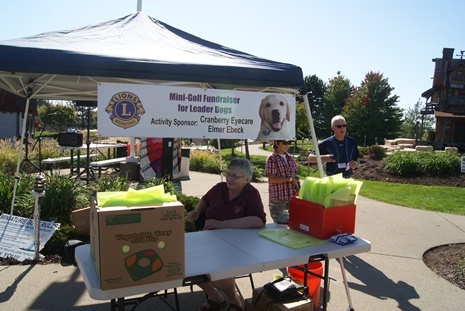 Proceeds from our annual Family Mini-Golf Outing, held at Fun Fore All, support Leader Dogs. VIP Sports Camp provides sports and recreation opportunities for children and teenagers who are visually impaired or blind. Day clinics and a four day long summer camp are available for youth ages 5-18. 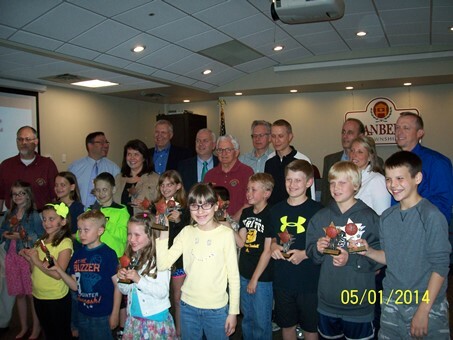 Our 2014 Hoop Shoot winners smile for the camera and the Cranberry Board of Supervisors who presented their award certificates. Kindergarten 1st Place: Ali Eckenrode. First grade 1st Place: Maggie Evelsizer, Danny Drennan. Second grade 1st Place: Susie Roscoe, Brady Stafford; 2nd Place Tie: Jack Allen and Jeevan Subramaniam. 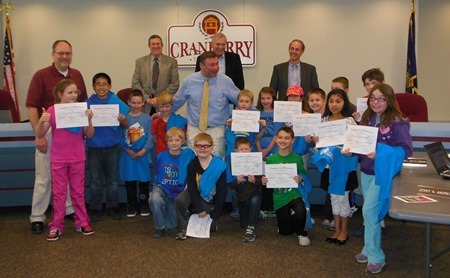 Third Grade: 1st Place: Tommy Drennan; 2nd Place – Naveen Sekaran; 3rd Place: Mark Evelsizer. Fourth Grade: 1st place girls (tie): Lexi Ocheltree and Brooke Eckenrode; boys 1st place: Jameson Grieco. Our annual Hoop Shoot meets two goals – having fun and raising money for the Slippery Rock VIP Sports Camp for visually impaired and blind teens. The Lions partnered with Seneca Valley's Rowan Elementary School Physical Education Dept. for the 3rd annual, classic "Hoop Shoot". $133. in donations was raised to benefit the VIP Sports Camp, offered to blind and visually impaired teens, through Slippery Rock University. Everyone had lots of fun - just 'shooting hoops'! 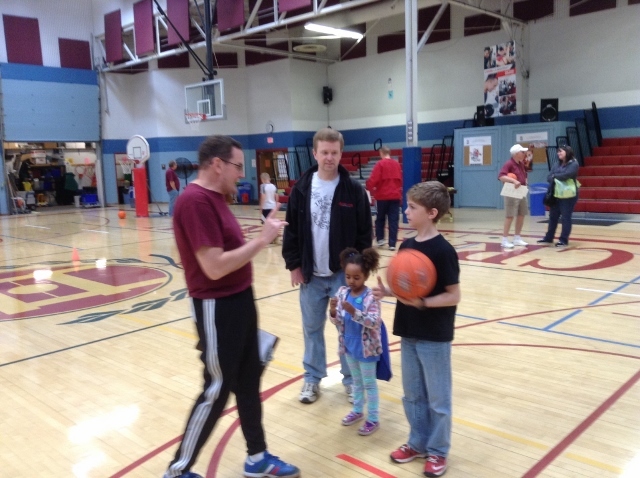 at the annual "Hoop Shoot" on March 9, 2013.